You can always rely on Death Waltz Recording Company to release something special and this time they have gone back to 70's British horror. 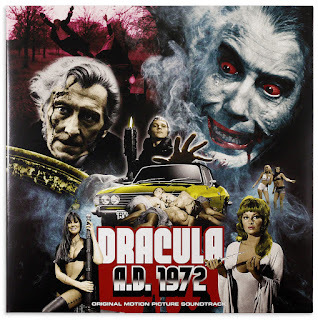 Now out to buy from their website and all other good retailers is the soundtrack to the 1972 Hammer film 'DRACULA A.D. 1972'. The film itself came at a time when Hammer was starting to lose traction with budgetary constraints and the overall film industry hitting them hard. 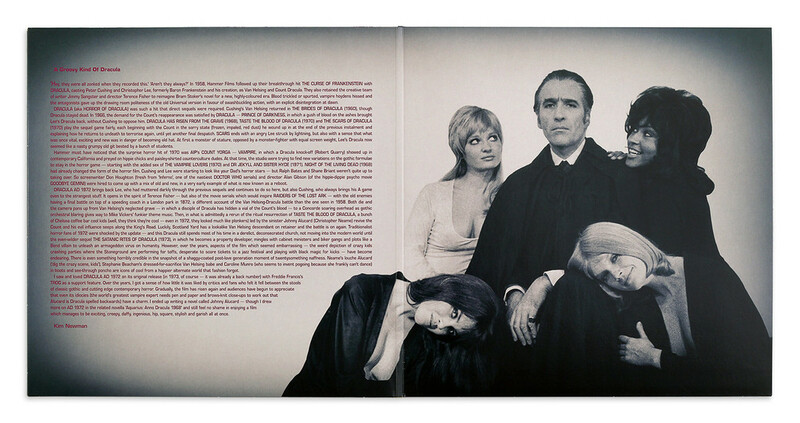 Hammer would make a total of eight films starring the blood sucking vampire Dracula, six of which would star the late Christopher Lee. It was inevitable what with the trends in cinemagoers would lead Hammer to change tact and have everyone's favourite vampire head away from the lofty Gothic films of early Hammer films and be flung further ahead to appear in a film of the time period that being the 70's. It was a bold move and it has gone on to have a fan base of its own right. It had an impressive cast with Christopher Lee leading as the title character and Peter Cushing on hand to play his nemesis Van Helsing, the first time since the 60's with 'THE BRIDES OF DRACULA'. Some lovely scream queens were also on hand to keep your blood pumping that would come in the forms of Stephanie Beacham and Caroline Munro. Mann', was on hand to give you possibly one of the best soundtracks outside of the usual Hammer favourites and hit you square in the face with a jazz infused soundtrack that was the thing at the time in films. Now you get to listen to that very soundtrack yourself at home with your flares and tank top on to keep you company. This is a beautiful release by Death Waltz Recording Company that will surely be a collectors item, especially when you count in the fact it only has a pressing of 1000 units. That is less then all the pints of blood Dracula has drank over the years....possibly. 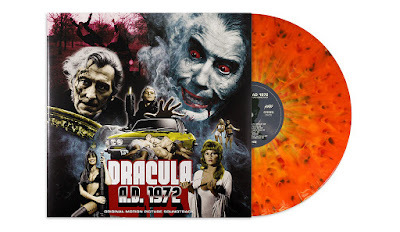 As you can see from the images to the left it is a lovely looking release and one that any fan of soundtracks, Hammer films or just horror in general would love to have in their collection. So what you waiting for head here and pick up a copy, you won't be disappointed.